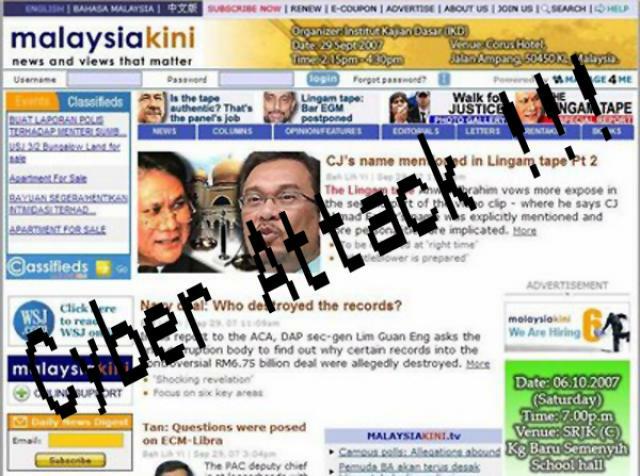 Malaysiakini - Malaysia's Most Popular News Website Shutdown's after cyber attack ! It has been reported that Malaysia's most popular news website Malaysiakini (http://www.malaysiakini.com) has been hit by cyber attack from 11 AM afternoon shutting the website down. The attack created a stir when the website stopped working just before the Sarawak election, making the website inaccessible to the readers. The attack has been diagnosed as Denial-of-service attack which is considered to prevent an Internet site or service from functioning efficiently or at all, temporarily or indefinitely. Denial-of-service attacks are considered violations of the IAB's Internet proper use policy, and also violate the acceptable use policies of virtually all Internet service providers. They also commonly constitute violations of the laws of individual nations. According to the technical team, the cyber attack has resulted in swarming the Malaysiakini servers to the point that they are unable to cope with the massive traffic. Highlighting the attack both the data centers TM Brickfields and Jaring have also been affected. Due to the attack the Malaysiakini has interrupted its operation and has posted all of its reports and updates in its facebook (http://www.facebook.com/MalaysiaKini). Malaysiakini.com offers daily news and views in English, Malay, Chinese and Tamil, delivering over 37 million page views and 750,000 video downloads per month to over 1.6 million absolute unique visitors (Google Analytics, August 2008). From July 2008, Malaysiakini became the most read and popular news website in Malaysia.